MySQL – 5.0 higher, PostgreSQL 9.0 or higher, Oracle 10g or higher or MariaDB. Apache web server 2.2 or higher compiled with mod_perl2 or higher. Postfix, Sendmail, Exim or you can use an external email provider. Run the following script to check if all the required modules are installed. Click on the ‘Check database settings’ button and if the database check is successful, click on the ‘Next’ button and configure the Mail server settings (or skip that step and configure them later). On the next page you will be provided with the OTRS back-end URL and login credentials. Log in at http://your_server_ip/otrs/index.pl , create new agents and work with these accounts instead the Superuser account. The OTRS daemon is responsible for handling any asynchronous and recurring tasks. That is it. OTRS has been successfully installed. 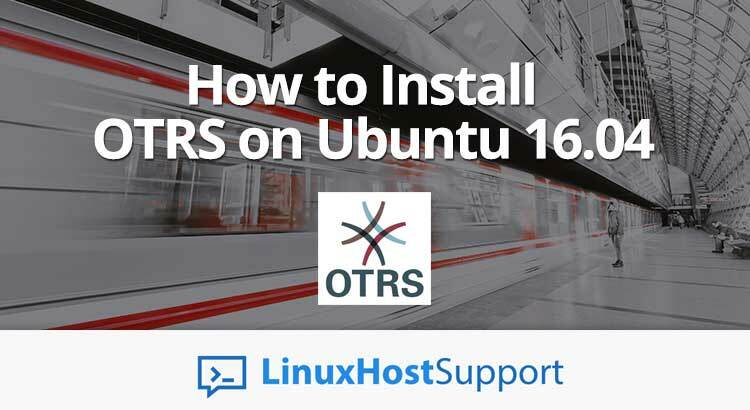 Of course you don’t have to install OTRS on Ubuntu 16.04, if you use one of our Server Support Services plans in which case you can simply ask our expert Linux admins to install OTRS for you. They are available 24×7 and will take care of your request immediately. PS. If you liked this post, on how to install OTRS on Ubuntu 16.04, please share it with your friends on the social networks using the buttons on the left or simply leave a reply below. Thanks. Please check bind-address in the my.cnf file or if you cannot find bind-address in the my.cnf file, then check in mysqld.cnf file.